Aging skin and wrinkles result from a combination of many factors. Cellular changes, collagen depletion, hormone loss, and damage caused by free radicals all contribute to the premature aging of our skin so we offer skin care products that are clinically-proven with prescription-strength formulations available only through medical offices. Chemical Peels eliminate the damaged outer layer of skin on the face to smooth texture, reduce scarring, and remove blemishes resulting in healthy, glowing skin. Obagi Blue Peel Radiance is a salicylic acid peel that effectively exfoliates the uppermost layers of damaged skin, leaving it refreshed and radiant. It is a gentle peel that has noticeable results after 1 treatment. In addition to chemical peels, topical products used as a system result in substantial improvement to many of these skin related conditions by restoring skin elasticity and collagen production, and reducing fine lines and wrinkles around the eyes and Décolletage. Dr. Kathleen Leone, MD, FACS and designated Wilmington Eye staff have been Obagi certified since June 2011. Obagi Nu-Derm System – an anti-aging therapy that penetrates below the skin’s surface to transform skin cell functions at the cellular level and correct the damage within… revealing healthy, younger-looking skin. 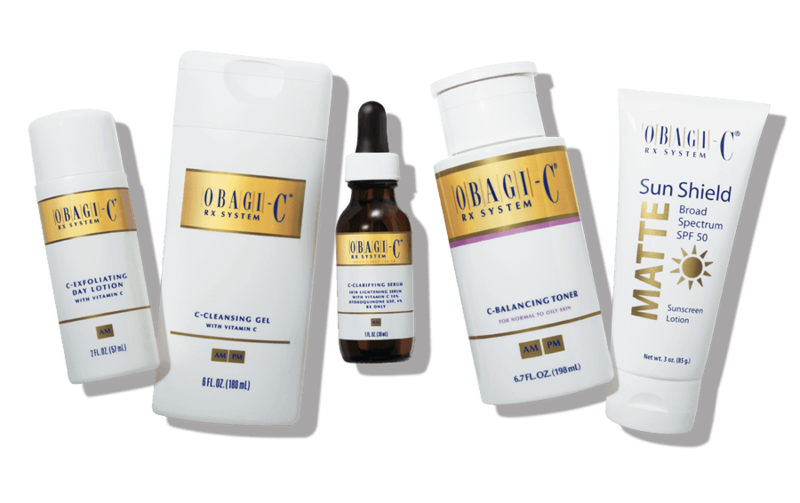 Obagi-C Rx System – Rejuvenate skin from the inside out with prescription-strength hydroquinone and Vitamin C – the only topical antioxidant proven to stimulate collagen production and protect against future skin damage. The comprehensive system includes products that are easily incorporated into your morning and evening skin care regimen. Obagi ELASTIderm Eye Products – eye treatments that include a revolutionary bi-mineral complex, copper zinc malonate, to help restore the elasticity around your eyes and reduce the appearance of visible fine lines and wrinkles. Obagi ELASTIderm Décolletage System – consists of a product using Penetrating Therapeutics™ that is clinically proven to help restore healthy skin. The therapeutic system diminishes the signs of aging, helping revitalize vulnerable skin. Prolonged exposure to the sun, pollution, and a lifestyle that is not always healthy, aggravate the natural, gradual physiological ageing process, leading to deterioration of the skin structure. This phenomenon is most evident at the level of the epidermis and upper papillary dermis. Clinical aspects include skin thinning, transparency, laxity, wrinkles, uneven colouring, pigmentary marks, vascular marks, and irregular texture.